Inspecting the integrity of new bridge construction to ensure years of safe support with routine maintenance is also just as important. 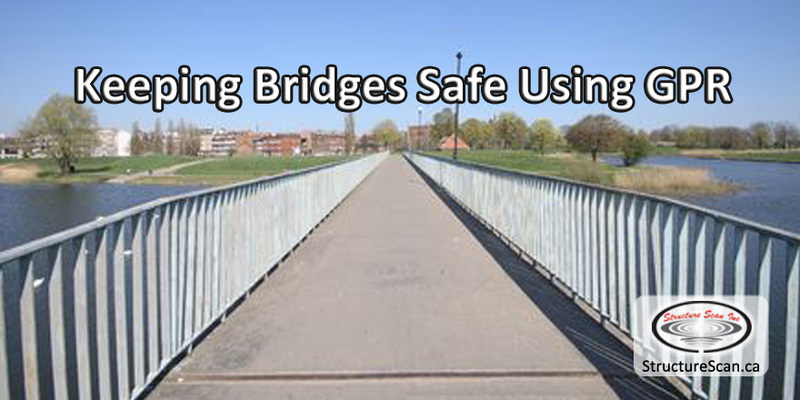 A quality, uniform asphalt or concrete surface is a key indicator of bridge deck integrity. The latest in Ground Penetrating Radar (GPR) technology is ideal for assessing the condition of the surface and avoiding breakdowns and costly repairs. Unchecked deterioration becomes a serious public safety and economic concern. The advantage to using GPR as a favourable solution to other non-destructive and destructive methods of analysis is because the data collected is quantitative and not subjective. Two ways GPR uses electromagnetic radiation pulses to image a surface are ground-coupled and air-launched systems. Provides better horizontal resolution which shows individual rebar and densely spaced measurements. The changes in the rebar reflection amplitudes can indicate the condition of the rebar as well as the surface. GPR is an effective method of quality assurance by measuring the deck thickness and rebar depth and confirming construction or repair requirements have been met. Most would agree, the cost of an ineffective analysis or leaving a bridge assessment until it becomes an emergency repair is too risky, both, financially and for safety. GPR is the ideal, non-invasive, cost-effective way of collecting data to plan for scheduled asphalt or concrete bridge preventative maintenance. Ultimately, saving time, money and peace of mind.